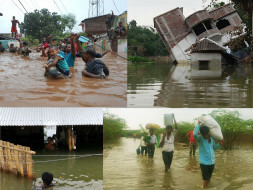 Floods- Alarming situation in many states, Time to act!! In the last 18 years, GOONJ has worked extensively on relief & rehabilitation in a series of disasters. This is an URGENT APPEAL to join GOONJ’s ‘RAHAT FLOODS’ campaign. In the last one month, we have channelized 14 trucks of relief material in the states of Assam, Manipur, West Bengal, Odisha, Rajasthan, Bihar, and Uttarakhand so far. The situation is alarming and millions of people are affected by the devastation. Our relief and rehab. efforts will continue for next few months as we know that after floods, winters also become a major disaster for millions without any roof and belongings. schools, colleges, offices and residential areas. Also, connect us with people who can send the material in bulk. 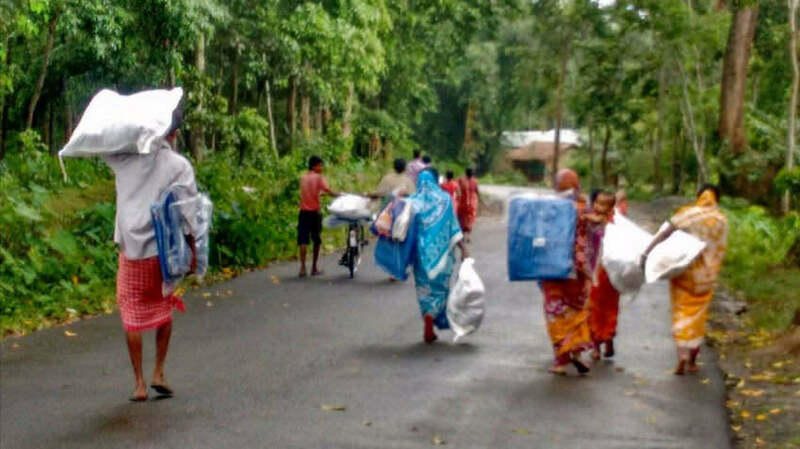 Material- Tarpaulins, old flex & ropes, mosquito nets, Dry ration ( non basmati rice, pulses, salt, masalas, milk powder, tea leaves, sugar), good quality blankets & woolens, toiletries, utensils- including for cooking, buckets, torch & batteries, umbrellas, crutches, slippers, candles, solar lights, kids clothing, sarees, bed-sheets and curtains, new undergarments & school material. Monetary contributions- for logistics and essential purchases. Last year alone we had 9 major states of India badly affected by floods and it called for our prompt intervention. Its a common knowledge that floods are devastating and sudden. But when its a flood prone area, constant motivation to adapt and improvise to such disasters is unique. We have come across various such stories of motivation over the years of our work in relief and rehabilitation. One such example is a small village named Chousa. Located in West Bengal with a dense population of 800, last year’s flood was the most devastating. They lost an important and only connecting path to reach the river bank. 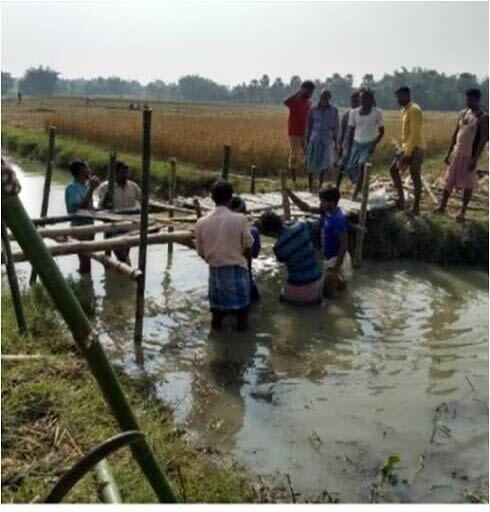 They used river water for their agricultural and other routine activities. More than hundred villagers participated in this activity and also contributed ten bamboos along with fifty sacks for a better support so that in rainy season the soil doesn’t get washed away easily. Now that the connecting path is repaired villagers are relieved about the fact that they don’t have to struggle to get back to the river bank. Another story is of a specific short cut. Not all short cuts are bad...there are few which actually does more good than harm. 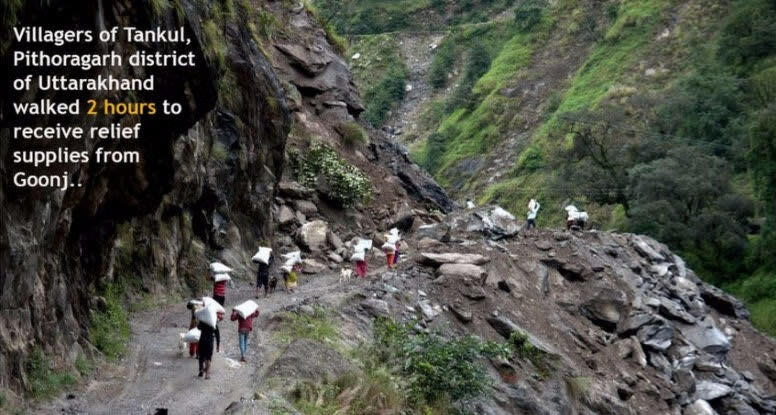 This story is about Beheratuli village, where people had to travel an extra 1.5 km to reach their nearest medical facility and school. Because there was no bridge to cross a canal. So with a little motivation from our end, people got together and built a bamboo bridge over the canal. This made their life easy and less time-consuming. 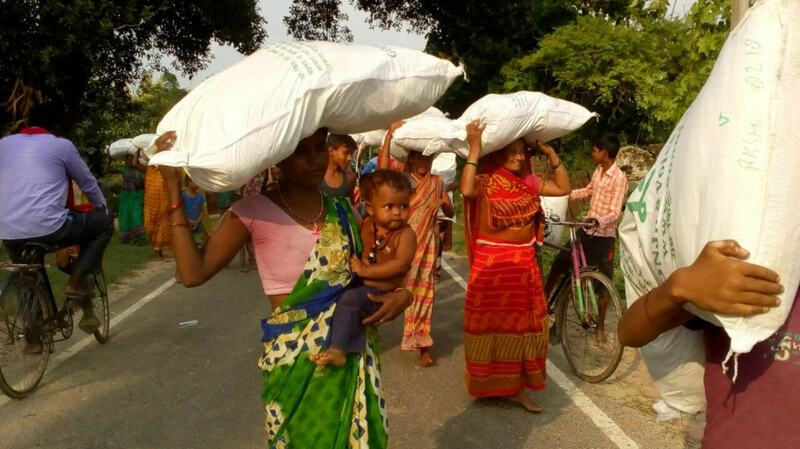 Affected communities received Goonj's 'family kits' for their contribution, under the RAHAT Floods - relief to rehabilitation initiative of Goonj.. 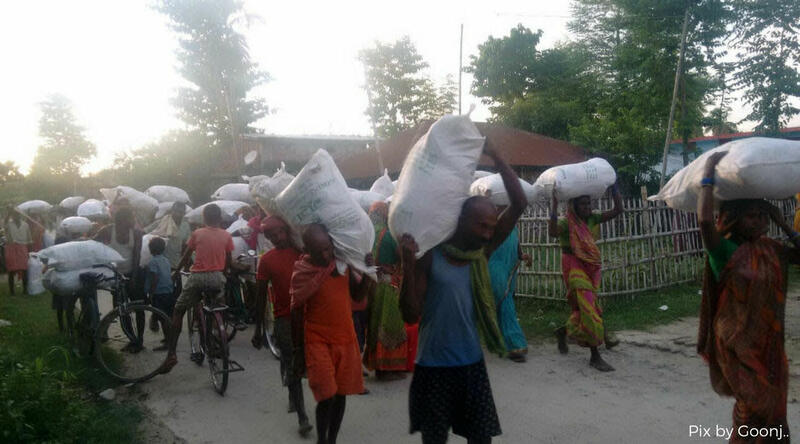 Here are some recent pictures of our work in Uttarakhand, Assam, Bihar and West Bengal. Similar work is going on in many other flood-affected states. As on 18th September 2017 33 big trucks of essential materials like dry ration, tarpaulins, blankets, utensils, toiletries etc. have been sent from our various offices to the flood-affected areas. So far, we have reached over 10,000 families with comprehensive 'Family Kits'. 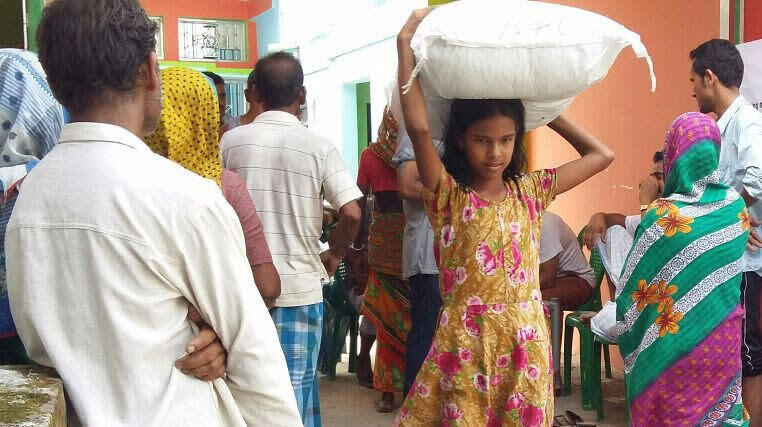 Our initial target is to reach about 75,000 families (approx. 500,000 people) in the next few months but the need is much more. Given the situation, we are certainly worried about the upcoming winters, as millions of people have not only lost their belongings but their kachcha houses as well. In the last few years of work, Goonj has worked on dignifying relief and in the process, people have rebuilt their damaged infrastructure through community action to sustain them in the long run. 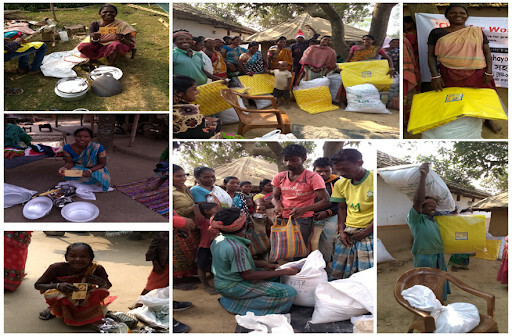 Urgent needs - Dry ration, blankets, tarpaulins, mosquito nets, utensils, buckets, solar light/lamp, kids clothing, woolens, sarees and most importantly money for essential purchases, transportation, and other logistics to reach it to people. Thank you for the support. Do spread the word. This video is directly from the field.